A little silly, a little smart, and a lot lost! There are many posts and resources available on the web with instructions for accomplishing this, but I found most to be either incomplete or inaccurate. The solution involves editing the rsreportserver.config file. 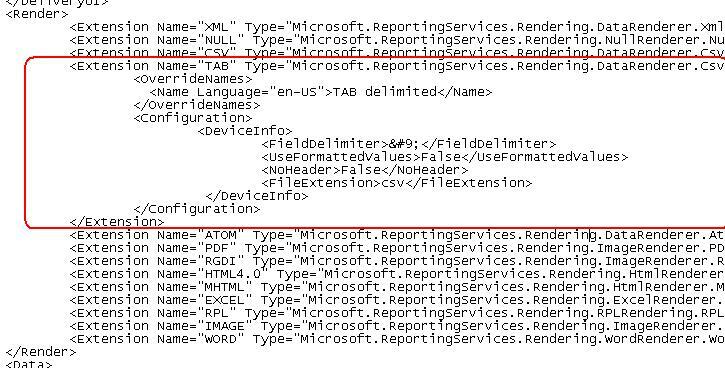 This can be found in the ReportServer installation folder (ex: C:\Program Files\Microsoft SQL Server\MSRS10_50.MSSQLSERVER\Reporting Services\ReportServer). I would strongly suggest making a copy of the file first. While odds are you won’t mess anything up, if you accidentally copy over some existing code or a cat walks across your keyboard while you are hitting Save…ouch! After making a copy, open the file in Notepad or your favorite text editor. In the “Render” section (about half-way down the file) simply insert the following code. I, myself, inserted it after the “CSV” code, but anywhere between the Render tags should be dandy. Save the file and restart the “SQL Server Reporting Services (MSSQLSVR)” service to load the changes. The image below shows an example of the code inserted into the file. 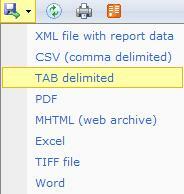 You should now have “TAB delimited” as an export option. Thank you to all those who posted how-to’s on this across the web, even if not always 100% accurate. I would have been unable to even get started without their help. This entry was posted in IT, SQL Server and tagged Export, SQL Server, SQL Server 2008, Tab Delimited by seanmkrause. Bookmark the permalink. hello, does the delimiter should be blank or we must include any special characters? because in the code you left it blank but in screenshot of config file it includes characters. Ahh good catch — I will need to work on getting the characters to display in the blog post. The characters will be as displayed in the screenshot! Thank you for submitting this! I did as you said and it worked perfectly. Some other sites imply you must change the csv extension type. Thank you! Excellent! Glad I could be of help. Thanks for this tip, this is really helpful! Just wanted to share some changes that made this even better for me. I wanted the results to be a text file, so I changed the file extension to TXT. Then I noticed that the dates in my resulting text file were showing up as MM/DD/YYYY 00:00:00 and numbers had five decimal places instead of two (my data types for numbers have 5 decimal places, but my SSRS report is formatted to only show 2). So I changed UseFormattedValues to True and that took care of the formatting for both the dates and numbers. Outstanding, Victoria! I am glad this helped and thanks for sharing your formatting tweaks! How did you change UseFormattedValues?? where is it?? what is the code to change this? ?